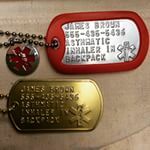 Add $7.50 to Customize your complete set with personalized text, chains & silencers. 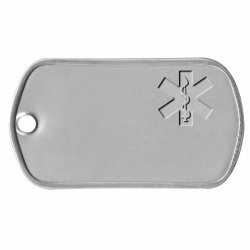 Stainless Steel Dull Finish Medical Information dogtag with Rod of Asclepius symbol (Star of Life) embossed, ideal to alert medical info. 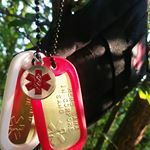 See an example of a fully customized Medical Asklepian Tag as a Medical Condition Alert tag. 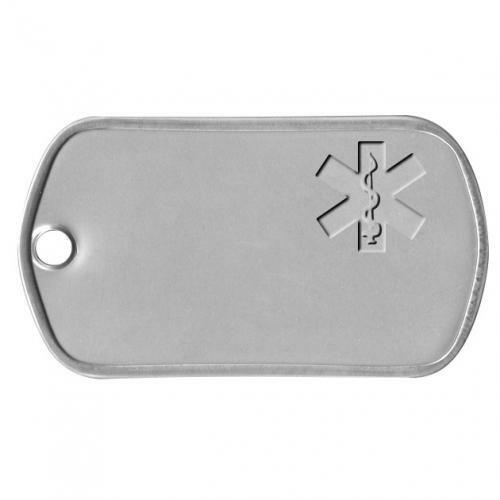 The Dogtag on this page is sold as an individual 'blank' without any custom embossing, chain, or silencer. If you would like to order a complete set with custom embossing, chains, and silencers for an additional fee, click the Customize button. 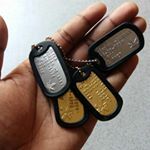 We have the largest selection of dogtag styles, materials and colors to choose from, most of them based on military specifications with rolled edges and either modern Embossed raised lettering, or vintage WWII style Debossed lettering.